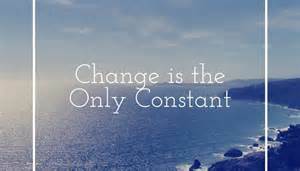 Over the past several years, this saying and many others about change have become trite. “Change is everywhere and to be successful you must embrace it.” “Change is the new normal.” “Champions eat change for breakfast.” You’ve heard it all before. What is somewhat new about change is the sheer pace of it. With the advent of breakneck technology advances, change is not only constant but accelerating. Every few months a new social media outlet comes along that can help you reach your customers while you’re still trying to figure out Twitter. In other cases, some businesses are wondering if they should create an app for their services. Messages travel throughout your company, not to mention the world, in nanoseconds. Besides keeping up with all the technology, there are still the normal business changes like new product introductions, reorganizations, and new workflows. What do you have to know and how should you take a leadership position around change in today’s workplace? Answer the big question, “Why?”: People yearn for context. They want to understand why things happen and how they fit into that equation. As things move ever more quickly, we often forget to answer this simple question of why (is this important, is this necessary, does this impact my business, etc.) in our haste to just get things done. Understand that some people will be more ready to change than you. When it comes to introducing technological change, there are people in your organization who will be asking why the company isn’t moving more quickly, or they may not ask, but their actions show they want to move faster. We have a whole generation who have grown up with Instant Messaging (IM), texting, Facebook, and other forms of social media. They’re comfortable with the fast pace of change technology has taught them. Harness their enthusiasm to learn all they can about the benefits and the drawbacks of various technologies. Engage them in understanding how a change could be used in your business or, just as importantly, why your business isn’t ready for whatever the change is. Be a storyteller. Think back to your childhood. I could mention something about a story you haven’t heard in thirty years and you could probably tell most, if not all, of the story to me. If I asked you to explain freshman algebra concepts to me, that would probably be more of a challenge (at least it would be for me). We are wired to remember stories. They help us relate to concepts and ideas by putting ourselves in situations and thus remember information better. Tell your people stories about the successes of previous changes where first there were doubts. Tell stories about how a team worked together to make something happen. Tell stories that help people paint a picture, create a vision, and understand how to move forward to accomplish change. Use social media. More and more organizations are using social media as way for people within the company to communicate with each other. Use social media yourself to ask questions, share updates, talk about successes, and ask for ideas. Encourage your team to use it as a way to have a productive conversation about the changes that are occurring . Soon you’ll see leaders emerge on your team, taking the reins of championing change. Again, if you need help in this area, there are people in your organization who are social media savvy.